We’d love your help. Let us know what’s wrong with this preview of Big Chicken by Maryn McKenna. What you eat matters—for your health, for the environment, and for future generations. In this eye-opening exposé, acclaimed health journalist and National Geographic contributor Maryn McKenna documents how antibiotics transformed chicken from local delicacy to industrial commodity—and human health threat—uncovering the ways we can make America's favorite meat safer again. To ask other readers questions about Big Chicken, please sign up. At this moment, most meat animals, across most of the planet, are raised with the assistance of doses of antibiotics on most days or their lives: 63,151 tons of antibiotics per year, about 126 million pounds. Farmers began using the drugs because antibiotics allowed animals to convert feed to tasty muscle more efficiently; when that result made it irresistible to pack more livestock into barns, antibiotics protected animals against the likelihood of disease. Who sh At this moment, most meat animals, across most of the planet, are raised with the assistance of doses of antibiotics on most days or their lives: 63,151 tons of antibiotics per year, about 126 million pounds. Farmers began using the drugs because antibiotics allowed animals to convert feed to tasty muscle more efficiently; when that result made it irresistible to pack more livestock into barns, antibiotics protected animals against the likelihood of disease. Legislators, policy makers (especially in the food industry), and the millions of people who eat the standard American diet of lots of chicken and animal products. People who have switched to only local organic meat, people who don’t eat meat at all, scientists and consumer advocates already aware of the problem. The grimness of this situation was observed early on in both the laboratory and the field: as simple organisms, bacteria can mutate and evolve extremely quickly. When exposed to the antibiotics that are used so frequently on farmed animals to help the animals gain weight and stave off disease, the microorganisms develop resistance to the medications designed to fight them. These bacteria can (and do) go on to infect human beings. Antibiotic-resistant infections aren’t something most of us think about until it hits home, but they cause 23,000 deaths and two million serious illnesses annually in the US alone. The individual stories McKenna collects are indeed heartbreaking. And because these infections jump not just from animal to person, but from person to person—they can infect anybody. From people who eat chicken daily to lifelong vegans, we are all at risk of being struck down by the bacteria originating in the factory farms and feedlots. Antibiotics have been so difficult to root out of modern meat because, in a crucial way, they created it. The drugs made it irresistible to load more animals into barns and protected animals and their growers from the consequences of that crowding. This, along with generous subsidies, made meat a cheap commodity that most Americans could now afford to eat daily, and often multiple times per day. And no industry has benefited more from these changes in meat production than the chicken business. Six weeks, a modern broiler’s age at slaughter, the author notes, would be barely preteen in a purebred chicken. Top-heavy, lethargic, and frequently suffering from a variety of production-based maladies, the modern broiler chicken is memorably compared in the text to “an olive balancing on two toothpicks.” Although not normally thought of as babies, today’s chickens are exactly that: they are younger at slaughter than either lambs or crate-raised veal calves; and their suffering and lack of motion is comparable to that of the calves in the much-despised “white” veal industry. Most informed adults now have at least some grasp on what “factory farming” is. Almost all US chickens (and other animals) have been raised for decades in this manner. It has made meat a cheap, universally available, and standardized product. Yes, as the author refreshingly notes, the burden of all of this doesn’t just lie on the huge, faceless corporations. It is the foundation of the chicken economy, and it is endorsed every day by anyone who ever bought a fast-food chicken sandwich, ordered wings in a bar, or picked up an extra tray of drumsticks because a supermarket put them on sale. Yet, food, and particularly meat, touches a nerve in people that isn’t as universally present in other controversial, daily presences in people’s lives. Even as it behaves in ways that any non-psychopath will find morally repugnant, most Americans still aggressively defend the animal agriculture industry, unlike say, the oil industry. Even the most progressive and rational thinkers will become very emotional when they think their food choices are being questioned—they appear to undergo an instantaneous lobotomy and suddenly they’re fountains of nonsense about lions, cavemen, and protein deficiency. Clearly, Americans cannot eat the eight billion or so chickens they consume every year being supplied by free-range model. McKenna also discusses some of the changes certain factory farms are making, usually after negotiations with animal welfare and consumer safety groups. Some companies are adding a few basic welfare measures in for the chickens, such as allowing natural sunlight to enter their sheds. Other producers have vowed to go antibiotic free, and certain food chains have got an advertising boost announcing they plan to serve antibiotic-free chicken. The author sees this as an encouraging step. “No antibiotics” means different things to different companies. For some, it’s no antibiotics after a certain point in a chick’s short life, for others, it’s avoiding certain types of antibiotics, and for still others, it is indeed no antibiotics at all. Companies who take this step do take the risk of being called out by the various producers’ groups that still defend the antibiotic-use model. Trade groups assail individual companies, such as restaurant chains, that choose to go antibiotic free. There is still a lot of pressure and lobbying to stick to this damaging way of doing things. While the author seems to think a combination of free-range and more responsible intensive farming is the only future for meat production in America, she ignores certain important developments and crucial issues. First off, more responsible farming costs more. Americans, millions of whom are already struggling, will have to absorb these costs. Not everyone can afford to visit boutique farms and buy heritage-breed hens, as is depicted in the pages of this book. If you're curious about what goes into the food we eat, I would recommend you take a look at this book. In very understandable terms, the author describes antibiotic resistance and its harm to animals and humans. An important book that many people should read and despite the title it's about more than just industrially-raised chickens: it could almost stand as a companion to Miracle Cure, William Rosen's comprehensive recent history of the invention of antibiotics. McKenna's book is about the entire system of industrially-raised food and its effects on our health and environment, including and in particular, antibiotic resistance. I couldn't define a plasmid before I read this - (Wikipedia: a genetic str An important book that many people should read and despite the title it's about more than just industrially-raised chickens: it could almost stand as a companion to Miracle Cure, William Rosen's comprehensive recent history of the invention of antibiotics. McKenna's book is about the entire system of industrially-raised food and its effects on our health and environment, including and in particular, antibiotic resistance. I couldn't define a plasmid before I read this - (Wikipedia: a genetic structure in a cell that can replicate independently of the chromosomes, typically a small circular DNA strand in the cytoplasm of a bacterium or protozoan), nor did I know the nearly magical way plasmids can carry antibiotic resistance across farms. So I found this book appalling - not in a graphic way such as when watching an exposé about factory farm horrors, but in what it reveals about the extent of and abuse of antibiotic use, for growth and disease, in agriculture. What a fascinating book. It starts with the history of chicken farming and moves on to how industrial farming of chicken (and other livestock also, but especially chicken) has been a much bigger contributor to antibiotic resistance than human medical use. 1. I think this is best read in conjunction with Tim Harford's Adapt. One of the most important things I learnt from this book is how consolidated and vertically integrated poultry farming has become in the USA (but worldwide in What a fascinating book. It starts with the history of chicken farming and moves on to how industrial farming of chicken (and other livestock also, but especially chicken) has been a much bigger contributor to antibiotic resistance than human medical use. 1. I think this is best read in conjunction with Tim Harford's Adapt. One of the most important things I learnt from this book is how consolidated and vertically integrated poultry farming has become in the USA (but worldwide in general), and how that giant scale has prevented individual farmers from experimenting and learning from each other. 2. It's slightly terrifying when you think that this book talks about the USA and Europe, but not about India and China - who will open that can of worms? 3. But at the same time, the last few chapters which describe how the megacorporations which started the use of antibiotics in chicken farms are now moving away from it in response to market pressure, are surprisingly hope filled and causing. And if the tide can reverse so quickly on AMR, maybe it will do so on climate change as well. I hope. 4. Despite all the bad news, this was not really able to push me towards vegetarianism. 5. This is a very interesting counterpoint to Unnaturally Delicious, which I had read at the beginning of the year. Fascinating, diving deep into the history of industrial chicken farming, and ranging widely over the state of the art and the cutting edge of antibiotic free intensive poultry raising. It was certainly scary and weird in places, but I was surprised at the hopeful note it ended on. A very readable, well researched history of antibiotic use in chickens. Although 400 pages seems a bit much for the nonspecialist, every chapter is relevant. Beginning in the 1940s as a growth enhancer, antibiotic use became widespread and difficult to eliminate because it made possible industrialized, cheap meat. The final chapters and epilogue provide hope but also compare the problem of antibiotic resistance to climate change; both are multifaceted complex issues. Bacteria are constantly evolving to develop resistance to antibiotics. Antimicrobial resistance is a huge public health problem, because a growing number of people are getting diseases that cannot be cured by standard antibiotics such as penicillin. Maryn McKenna is sounding the alarm that there may come a time when antibiotics don’t work anymore. This book tells the story of “Big Chicken,” how chicken meat has become a factory farm product since World War II. One of the ways farmers have been ab Bacteria are constantly evolving to develop resistance to antibiotics. Antimicrobial resistance is a huge public health problem, because a growing number of people are getting diseases that cannot be cured by standard antibiotics such as penicillin. Maryn McKenna is sounding the alarm that there may come a time when antibiotics don’t work anymore. This book tells the story of “Big Chicken,” how chicken meat has become a factory farm product since World War II. One of the ways farmers have been able to cut costs and increase output of chicken meat is to put antibiotics in the food of all of their chickens. The widespread use of over-the-counter feed antibiotics to increase production in agriculture is one of the causes of antimicrobial resistance in bacteria that cause deadly diseases in humans. This problem is beginning to be addressed, no doubt in part because of the work of journalists such as the author of this book. The Animal Drug User Fee Act of 2003 (amended in 2008 and 2013), among other things, requires agribusiness to disclose the antibiotics that are being used. USDA National Organic Standards since 2002 make it possible for consumers to know whether meat is organic (and therefore mostly antibiotic-free). In 2016, the FDA established a regulation to address antimicrobial resistance by promoting “judicious use” in agriculture of antibiotics that are also used to treat diseases in humans. 81 Fed. Reg. 57796 (August 24, 2016). Consistent with Guidance for Industry (GFI) #209 and GFI #213 (published in 2013), the drug companies changed the antibiotics that are medically important for humans to veterinary prescription (Rx) status or veterinary feed directive (VFD) status, meaning these antibiotics are not supposed to be fed to animals without a prescription from a veterinarian. Rx status means the drug is only supposed to be prescribed to treat a sick animal, and VFD status means a veterinarian is only supposed to write an order to put the drug in the food of a group of animals when there has been a disease outbreak. This is a change from the prior practice where farmers bought antibiotics that are prescribed to humans over-the-counter and fed them to all of their animals just to make them grow faster with less expensive feed. Antibiotics that are not used for humans can still be purchased over-the-counter and put in the food of all of the animals. Attention to this issue has also caused the big chicken producers, starting with Purdue, and the big chicken sellers such as McDonalds, Walmart and Chick-fil-A, to move in the direction of marketing their chicken as antibiotic-free. There is also a growing market for old-fashioned free-range, organic chicken sold in stores such as Whole Foods to consumers who are willing and able to pay twice as much for a more natural, gamier type of chicken. I did not think this book presented the information very objectively or in a well-organized way. It seemed like the author was trying to shock people into believing that there was some huge problem with the food supply, a little bit like the famous muckraker Upton Sinclair. The book gives the impression that there is a big threat of contracting antibiotic-resistant Salmonella from eating chicken bought in a typical supermarket. But is this really a big risk if you wash surfaces and hands that come into contact with raw meat and avoid eating raw eggs and undercooked meat? Also, it’s a bit Pollyannaish to believe that the U.S. government is going to require, or even subsidize, chicken farming to be done the way it is done under France’s Label Rouge program. This book is an excellent discussion and expose on the story of how antibiotics and medicine in chickens have altered the effectiveness of antibiotics on humans. The material is well researched, and provides a critical look at the various aspects of growing, expanding the analysis outside of simply chickens, but to cows and pigs as well, which allows for the reader to truly see the impact. Overall, the book leaves some things to be desired, because the cohesion and purpose of the message is lost This book is an excellent discussion and expose on the story of how antibiotics and medicine in chickens have altered the effectiveness of antibiotics on humans. The material is well researched, and provides a critical look at the various aspects of growing, expanding the analysis outside of simply chickens, but to cows and pigs as well, which allows for the reader to truly see the impact. Overall, the book leaves some things to be desired, because the cohesion and purpose of the message is lost, and the author even concludes how many corporations changed their practices, to better align with governmental regulations. While the book included many interviews with different chicken farmers, they appear to have very little agency, which is something that is mentioned only in passing, but this aspect is something that should be unpacked in more detail, because I think that analysis can tell a narrative worth considering. While there are a few things that could be changed, the book was a massive undertaking in what can be described as a closed group of corporations who do not want to share their trade secrets with the government or the public. The author takes on this challenge and finds farmers who are willing to discuss the business model, expose the secrets, and share their opinion of the farming practices. While some would think of this as an expose, it does not ever feel like gotcha journalism, or a driven narrative, but features documented sources and notes, and admissions of what companies would not speak with the author, (also included in the notes). I kind of wish I hadn't read this. Sometimes ignorance is bliss. Chickens + infectious disease = one of my favorite books this year. Definitely worth a read, even if neither of those topics are your thing. It's fascinating, informative, and frightening. Well researched book on the origins of the poultry industry as we know it today and the impact of certain agricultural practices on human health. I look forward to reading anything this author puts out in the future. Journalism at its best. Very good. Though long, don't let that scare you off. Not dry or boring. It is info you will want to know for your own good. A thorough read on how antibiotics use in chicken has lead to the surge in microbial resistance to drugs. This book is written in a way to put in complex medical terms into non-patronising lay-man terms. I hope it becomes such a hit that like "the immortal life of Henrietta Lacks". It is not complete doom as corporations as farmers and corporations are starting to phase out antibiotic practice and there is a list of course of actions consumers can take. All in all great informative read. Maryn McKenna has written an excellent book about the how the use of antibiotics in raising farm animals is directly assisting in the creation of drug resistance bacteria. She points out that new antibiotics are becoming too expensive to research and bring to market because bacteria become almost immediately resistant to the new drug before the company can recoup the cost of development. The CDC director is quoted that a post-antibiotic era is upon us and for some patients who have a drug resist Maryn McKenna has written an excellent book about the how the use of antibiotics in raising farm animals is directly assisting in the creation of drug resistance bacteria. She points out that new antibiotics are becoming too expensive to research and bring to market because bacteria become almost immediately resistant to the new drug before the company can recoup the cost of development. The CDC director is quoted that a post-antibiotic era is upon us and for some patients who have a drug resistant illness, it is already here. A scary thought for those who have studied medical history. The books starts with the discovery of antibiotics and their immediate use on the farm as growth promoters and preventives for possible disease in crowded chicken houses. It did not take long before antibiotic resistance was noted but it took much effort, money and sleuthing to prove the cause and effect of antibiotic use on the farm and antibiotic resistant illness in the population. Painstakingly over time the evidence overwhelmingly points to a correlation. Much of this book was interesting, but it didn't seem to all fit together very well. I went in expecting a general exposé of industrial chicken farming, or, per the subtitle, something about how growth-enhancing antibiotics led to bigger broiler chickens. This was seemingly confirmed when the opening of the book is about how woooonderfully delicious chicken from French farmers' markets is; there is a rhapsody about the flavor and texture of French chicken is compared to the squishy, bland America Much of this book was interesting, but it didn't seem to all fit together very well. I went in expecting a general exposé of industrial chicken farming, or, per the subtitle, something about how growth-enhancing antibiotics led to bigger broiler chickens. This was seemingly confirmed when the opening of the book is about how woooonderfully delicious chicken from French farmers' markets is; there is a rhapsody about the flavor and texture of French chicken is compared to the squishy, bland American stuff. McKenna swerves dramatically after that introduction, though. Something like 2/3 of the book proceeds to be about the history and spread of antibiotic-resistant bacteria. While the vast majority (though not all!) of that discussion is about how agricultural use of antibiotics contributes to that threat, the discussion is not all that specifically chicken-focused: cattle and hog production are almost as central. That discussion is married to occasional discussions of the breeding stock and quality of life for farm chickens, but those issues are minorities of the book and feel somewhat divorced from the main story she's telling. She does make an attempt to tie things together in the last few chapters, where she explores how a few current-day chicken farmers and agribusiness outfits, both in the United States and abroad, are attempting to break free of the high-antibiotic model even if it makes for more expensive meat (although McKenna argues that antibiotics don't save that much money; since she clearly worries intensely about antibiotics for other reasons, it's not obvious how much credence to give her on that point). She ends up doubling back to "isn't French chicken delicious? Don't you want that deliciousness here?" at the end of the book, but...it's not really obvious that that's relevant to her main story of antibiotic use. From everything she says, you could totally bathe the French chickens in antibiotics and still have the taste and texture results she's trying to sell, or conversely you can retain most characteristics of American industrialized farming without using antibiotics and still end up with what she considers inferior American poultry. She's obviously right that the American mindset of "who cares what nature does with chickens, let's tech this process up" leads to both outcomes, so they're not totally unrelated. But it just felt incoherent. I’m a vegetarian and a veterinary student. I also spent some time in Delmarva learning it’s poultry history and the nuances that go into poultry farming. I loved the book for its historical accuracy but the bias framing made it difficult for me to rate this better. Although accurate the omission of information from one side or the other prevents readers from critically analyzing the complexity of the issue. One very clear example of this is on page 268. The author argues “Vaccines are a more effic I’m a vegetarian and a veterinary student. I also spent some time in Delmarva learning it’s poultry history and the nuances that go into poultry farming. I loved the book for its historical accuracy but the bias framing made it difficult for me to rate this better. Although accurate the omission of information from one side or the other prevents readers from critically analyzing the complexity of the issue. First of all I want to address the fact that vaccines don’t always offer life long protection or immunity. Vaccination efficacy varies. Vaccine reactions do occur in poultry and can cause high mortalities due to the development of the disease in which it was suppose to protect against. Those that survive will become protected. Some may overcome the primary disease but be die from secondary bacterial infections. I don't really know how to rate a book like this. The research seemed thorough and reliable, and the science was imparted clearly. But I didn't like...enjoy reading it...? It was research for me. That said, highly interesting. The tl;dr version is: agricultural uses of antibiotics are completely unsustainable. They were a true miracle drug, and offered an incredible short-term boost to global meat availability. But we just can't make new ones as quickly as bacteria can adapt. Both human health an I don't really know how to rate a book like this. The research seemed thorough and reliable, and the science was imparted clearly. But I didn't like...enjoy reading it...? It was research for me. That said, highly interesting. The tl;dr version is: agricultural uses of antibiotics are completely unsustainable. They were a true miracle drug, and offered an incredible short-term boost to global meat availability. But we just can't make new ones as quickly as bacteria can adapt. Both human health and animal welfare is compromised by casual use of agricultural antibiotics. 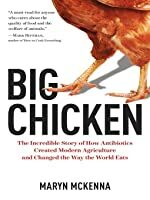 Just finished reading 'Big Chicken: The Incredible Story of How Antibiotics Created Modern Agriculture and Changed the Way the World Eats' (2017) by Maryn McKenna. I decided to borrow a copy to understand how the unscrupulous and excessive use of antibiotics in the poultry industry contribute to the epidemic rise in antibiotics resistance. 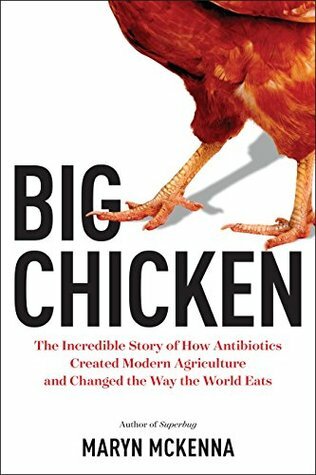 'Big Chicken' is a textbook example of riveting investigative journalism, where author McKenna tries to comprehensively identify the various factors and circum Just finished reading 'Big Chicken: The Incredible Story of How Antibiotics Created Modern Agriculture and Changed the Way the World Eats' (2017) by Maryn McKenna. I decided to borrow a copy to understand how the unscrupulous and excessive use of antibiotics in the poultry industry contribute to the epidemic rise in antibiotics resistance. 'Big Chicken' is a textbook example of riveting investigative journalism, where author McKenna tries to comprehensively identify the various factors and circumstances in the history of the poultry industry that eventually led to unprecedented resistance to antibiotics, causing the scientific community to warn about an imminent medical crisis, as well as the effects of overbreeding towards the environment as a result of excessive antibiotic administration. It paints a near-apocalyptic portrayal of a future to highlight the sheer gravity of antibiotic-resistant bacteria (MRSA), and the dire need to fix this crisis before it's too late. It is also a classic case of exploring and exposing the dark side of capitalism, of how an industry's drive to meet market demand spur the need to increase supply by multiple folds. At the same time, this circumstantially coincided with the post-WWII timing, where new antibiotics were discovered and the desperate need for food supply for warfare and deterrence against disasters towards food crops further buttressed and warranted the use of antibiotics on poultry. As amazing as it sounds, it highlights the fascinating notion raised by historians of how scientific discoveries are spurred not by innovation, but actually by wars. This exploration into the poultry industry is a exemplary case of understanding causality. Running in the same vein as Kate Moore's 'Radium Girls', the book's main objective is to play detective and trace back how their respective problems came to be, emphasizing the sheer difficulty and complexity of connecting the dots and pinpointing the true cause of the outbreak of salmonella and E. coli, and identifying exhaustively the subtle patterns in the string of seemingly unrelated cases. The only main difference is, the main characters in Moore's book are the girls themselves whereas the main characters in McKenna's are the two bacteria, salmonella and E. coli. Instead of identifying and concluding just how dangerous MRSA are and how the poultry industry has to be reformed, McKenna also offers a solution that can help curb the outbreak as illustrated through case studies of selected farms in France and the Netherlands. It involves a complete change in the poultry industry and perhaps even the country's economy, where the interests of each group must be respected and redefined in order to prevent future outbreaks. The author carefully balances pessimistic prudence of the virulence of MRSA, with optimistic hopefulness towards consumers' rising awareness towards the dangers of MRSA and their changing consumption habits; analyzes how the industry tries to improve the situation by exploring the challenges faced by 'anti-antibiotic' farmers in ensuring a sustainable antibiotic-free environment for their animals. This is a remarkable account, meticulously researched and well written, of the history of antibiotics in agriculture, using the industrially farmed chicken as the prism through which to focus the mainly U.S. story. The author explains the science of bacteria and antibiotics, farming and agricultural practices, corporate and regulatory institutions, individual actors, and outcomes over time. Chronologically it gets to the non-legally binding FDA guidance issued in 2012 and 2015 and contains some This is a remarkable account, meticulously researched and well written, of the history of antibiotics in agriculture, using the industrially farmed chicken as the prism through which to focus the mainly U.S. story. The author explains the science of bacteria and antibiotics, farming and agricultural practices, corporate and regulatory institutions, individual actors, and outcomes over time. Chronologically it gets to the non-legally binding FDA guidance issued in 2012 and 2015 and contains some discussion of the WHO health initiatives regarding overuse of antibiotics as well. The author explains the microbiology of antibiotic-resistant bacteria in terms a lay reader can understand. Dosed bacteria select over time for those which are resistant. These bacteria remain in the meat and migrate into the environment, other animals and humans. New resistant strains develop. And resistance can be carried by plasmids—extra-chromosomal genetic elements that reproduce and carry resistance from one bacteria to another, “stacking up” resistance. In a sobering, even alarming section of the book, McKenna explains that bacteria have become resistant to an array of human treatment antibiotics, including some of the “last resort” antibiotics, like cipro. Observing the power of the profit-making and centralizing poultry industry and its allies, McKenna charts their resistance to the emerging science of antibiotic-resistant bacteria transmitted through agricultural practices. They have historically argued that “there wasn’t enough evidence” of the human disease impacts of antibiotic-resistant bacteria (“The tobacco company defense”) to delay or thwart even moderate regulatory efforts and have often fought or defied the FDA. While the non-binding agreement reached recently forbids use of human-use antibiotics for growth promotion, it is unclear generally and from this book how industrial chicken production intends to treat disease prevention and disease treatment uses; it isn’t clear how large the loopholes here are and how implementation is going. The book explores non-antibiotic, natural chicken farming and the progress towards antibiotic limitation in the chicken and farm animal industries in France (especially Label Rouge), the Netherlands and Britain. It also examines in more detail in the case of several chicken farmers and corporations in the U.S. It narrates the history of Perdue’s abstention from human-use (and some additional) antibiotics. White Oak Pastures, a Georgia firm, remade a single-species conventional farm into a large certified organic property: multispecies, pasture-based, zero-waste lab, freeing poultry not only from antibiotic use for also from fast growth genetics and industrialized production. Bell & Evans, a large privately held poultry company, relies on cleaner feed, sanitary technologies and natural equivalents to antibiotics like oregano oil (“a perfected version of conventional indoor chicken: clean, high welfare, antibiotic free”). In this section of the book the detail seemed a bit excessive and may suggest that informed meat consumers as well as informed citizens pressing for policy solutions propel progress. This is a meticulously researched and highly readable book on the history of the chicken "industry" and the perils resulting from the factory farming of the animal that forms a large part of the American (and the world's) diet. Chicken "farming" as it had become in the US particularly evolved in the 1920s when it changed from small farms which provided the eggs, chickens, feed and sometimes the slaughtering of many varieties of chicken. This poultry was tasty, although not homogeneous, and was t This is a meticulously researched and highly readable book on the history of the chicken "industry" and the perils resulting from the factory farming of the animal that forms a large part of the American (and the world's) diet. Chicken "farming" as it had become in the US particularly evolved in the 1920s when it changed from small farms which provided the eggs, chickens, feed and sometimes the slaughtering of many varieties of chicken. This poultry was tasty, although not homogeneous, and was the pride of Sunday dinners. In order to increase production, insure cheaper development of the chickens, the trend was developed that streamlined the growth of this favorite food-providing more and cheaper chicken. A number of developments assured this trend: Only the fastest growing, large-breasted breed of chickens were recommended. Larger chicken houses were more practical. Antibiotics were added to the feed. "Growers" were sold baby chicks by hatcheries, provided food and drugs, and then collected and processed in large plants. This process (still very common) was economical and provided a predictable size and taste in the birds. The growers were only caretakers, as large corporations took over the streamlined process of chicken production. The big problem, which was known early in this development, was that multiple bacteria were rapidly becoming resistent to the antibiotics being fed to the chickens. While the industry giants argued against the fact that this was problematic, more and more medical practitioners and scientists were seeing human infections that could not be treated because the organisms responsible were resistant to multiple antibiotics. Calls for stricter requirements for antibiotic use were fought in courts and in congress. While factory farms are still common and large processing plants still churn out various forms of chicken cheaply, there is a growing trend among farmers, chefs and activists away from the "factory produced" chicken and the routine use of antibiotics. The knowledgeable American public is looking for animal products free of hormones and especially antibiotics. The move is now toward better, healthier chickens-that also taste better. Unfortunately, the bulk of antibiotics produced in this country are still being fed to animals (not so much to chickens anymore, as it was eventually determined that they actually had little effect on the production of bigger, healthier chickens). This is a cautionary tale of ' science 'going wrong-to the detriment of those stricken with untreatable infections. Maryn McKenna had done the world a great favor in the writing of this saga of greed and hubris and its devastating effects on chickens, farmers, and the availability of effective antibiotics. This well-researched documentation of the global discovery and introduction of antibiotics to our food and medical systems is fascinating. Goes way beyond the grasp of "big chicken." 1940s saw the launch of the antibiotic "rush" and the carelessness with which the FDA threw antibiotics into food production. This alone allowed farmers to crowd more animals into smaller spaces, feed them worse food, and care for them less. Chickens were fed antibiotics, were soaked in antibiotics, and final product This well-researched documentation of the global discovery and introduction of antibiotics to our food and medical systems is fascinating. Goes way beyond the grasp of "big chicken." 1940s saw the launch of the antibiotic "rush" and the carelessness with which the FDA threw antibiotics into food production. This alone allowed farmers to crowd more animals into smaller spaces, feed them worse food, and care for them less. Chickens were fed antibiotics, were soaked in antibiotics, and final products were painted with antibiotics. 1960s was the discovery of plasmids, which are transferrable immunity between bacteria. Bacteria could be resistant to a whole host of drugs they'd never been exposed to before. Pharmaceutical companies refuted all negativity toward animal antibiotics. 1970s-90s Study after study. Resistance had gotten so out of hand that hundreds of thousands were getting sick, and scientists had discovered bacteria that were resistant to the very last weapon we have against them. Cue the realistic threat of antibiotic apocalypse. Due to the intense carelessness of the FDA, it wasn't until 2001 (60 years later!!) that they actually conducted a survey of how many drugs were being pumped into our meat. Human medicine was 3 million pounds, agriculture was 24.6 million. Currently, 80% of the antibiotics sold in the United states and more than half of those sold around the world are used in animals, not humans. This is one of the best books I've read in some time. I'd recommend it to anyone who is interested in where our food comes from, human health, animal welfare, antibiotic resistance, and history. The emergence of chicken as a dominant protein source in Western diets, and the related use of antibiotics in industrial livestock have had a number of economic, social, and infectious-disease related outcomes, and Maryn McKenna deftly intertwines history, scientific evidence, and glimpses into individua This is one of the best books I've read in some time. I'd recommend it to anyone who is interested in where our food comes from, human health, animal welfare, antibiotic resistance, and history. The emergence of chicken as a dominant protein source in Western diets, and the related use of antibiotics in industrial livestock have had a number of economic, social, and infectious-disease related outcomes, and Maryn McKenna deftly intertwines history, scientific evidence, and glimpses into individual human stories to highlight the issues of antibiotic use in the poultry industry, and how they arose. McKenna writes so well ... this book is incredibly interesting, and easy to read! It's clearly well-researched, which will not surprise readers of her previous books (and articles), and she manages to explain the science in such a way that non-experts will understand (but won't be dull for experts). She is adept at highlighting the risks and dangers associated with antibiotic resistance, without descending into unmitigated panic. I was particularly impressed with her respect and evenhanded treatment of individuals (historical and current) who are portrayed in the book, even in cases where decisions/actions have led to some detrimental consequences..
-it’s life is more humane, including foraging, roosting, flying, etc. this will make the chickens smaller and more ‘gamely’. But if a chicken is stuffed in a tiny house, eating a prepared feed, and physically unable to behave like a chicken, then it’s probably living in conditions that necessitate and indicate antibiotic use. I read this book in a day and was enthralled. I think Maryn did an excellent job of laying out the main ideas and advanced her story rapidly but in sufficient detail to avoid unnecessary confusion, though some diagrams of how plasmids work would have been nice, a s well as maybe a "cast of characters" listing more common diseases and antibiotics. These are small issues, however, given the strength of the book as a whole. I particularly liked her ability to move from the personal stories to the br I read this book in a day and was enthralled. I think Maryn did an excellent job of laying out the main ideas and advanced her story rapidly but in sufficient detail to avoid unnecessary confusion, though some diagrams of how plasmids work would have been nice, a s well as maybe a "cast of characters" listing more common diseases and antibiotics. These are small issues, however, given the strength of the book as a whole. I particularly liked her ability to move from the personal stories to the broader picture and back again. Both are necessary to give the reader an inkling of the effects of these processes on individuals, both those affected by food-borne disease and those who raise the food, and an understanding as to how this matters on a worldwide scale. Sobering to realize a strain of resistant bacteria can fly in from anywhere in hours and make a group of people sick in days. I am not in the poultry industry nor do I work on microbes and antibody resistance, but I do feel this book was well researched and laid out and I found it compelling. The notes are extensive and the references cited were equally so. I finished this while in bed with gastric flu, which drove home the point of getting sick from food--the author opens the book with a particularly nasty case of food poisoning. Since reading on the author's blog about her forthcoming book on antibiotic resistance, I have been waiting to read it. McKenna ably uses chicken (as the bird and as the food) as a vehicle to tell the story of antibiotic resistance has been by the millions of individual decisions we have made as a civilization. The research I finished this while in bed with gastric flu, which drove home the point of getting sick from food--the author opens the book with a particularly nasty case of food poisoning. The research is up-to-date, and is current early into the second half of 2017 (the book was published September 2017). A great introduction to anyone interested in the antibiotic resistance problem (a huge one) and the issues surrounding the industrialization of our food. Finally a (sub)title that says what it means! McKenna presents the stunning story of antibiotics in meat animals and the effect on overall health in both animals and humans. McKenna works her narrative around chickens since they are appear to be the largest users, fastest growing (birth to slaughter), and most consumed animal in the modern American diet, but cows and pigs are also touched upon. The most alarming facts revolve around public health and the blatant "blind eye" regulators turn toward Finally a (sub)title that says what it means! The most alarming facts revolve around public health and the blatant "blind eye" regulators turn towards the connection between the use of antibiotics and the rise of humans seeking treatment for both acute and chronic human illnesses. Luckily, McKenna is able to leave us on a mostly high note with tales of producers who willingly, and to their benefit, eliminate antibiotics as a growth promoter AND as a preventative (illness is a justified use) and prove the point that the laziness of "bigger, faster, cheaper" generally creates more problems than solutions. Maryn McKenna is a journalist and author who specializes in public health, global health and food policy. She has reported from epidemics and disasters, and farms and food production sites, on most of the continents, including a field hospital in New Orleans during Hurricane Katrina, a Thai village erased by the Indian Ocean tsunami, a bird-testing unit on the front lines of West Nile virus, an Arc Maryn McKenna is a journalist and author who specializes in public health, global health and food policy. She has reported from epidemics and disasters, and farms and food production sites, on most of the continents, including a field hospital in New Orleans during Hurricane Katrina, a Thai village erased by the Indian Ocean tsunami, a bird-testing unit on the front lines of West Nile virus, an Arctic graveyard of the victims of the 1918 flu, an AIDS treatment center in Yunnan, a polio-eradication team in India, breweries in France, a “Matrix for chickens” in the Netherlands, and the Midwestern farms devastated by the 2015 epidemic of avian flu.